The British Columbia contingent of my husband's family headed east a couple of weeks ago for a family reunion in Jasper. Long days in the car for Little Miss A and Little Miss S. You might remember the little bunny (whom I named Carmen - thanks to Pondside) for 2 1/2 year old Miss A. For Little Miss S, 14 months old, a different toy was required. 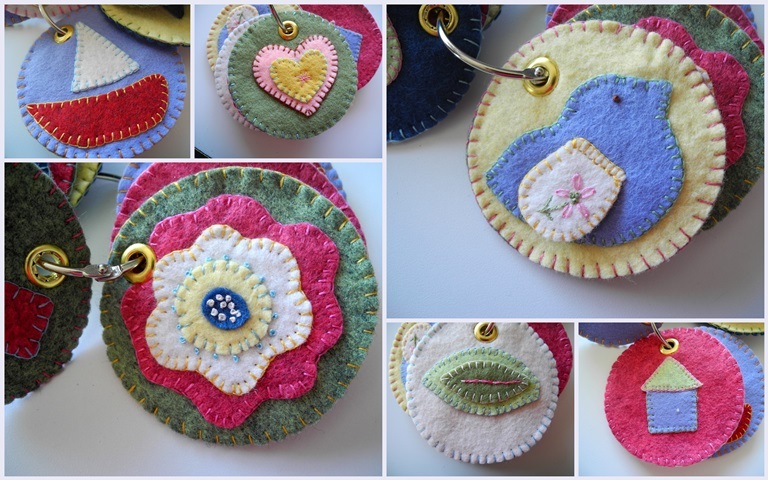 I cut out felt circles, using a jar lid as a pattern, 14 in all. On 7 of them I appliqued a small picture: a leaf, a flower, a bird, a fish, a heart, etc. On the other 7 I appliqued a geometric shape. Two circles were joined together with buttonhole stitch, an eyelet made, and there was a little toy for Miss S to play with. The felt circles can easily be removed from the ring. I've noticed that Miss S prefers them apart so she can pick up as many as she can in her tiny hands and scrunch the felt together. Or she places them on tables or the floor. I like to use wool felt. Yes, it's more expensive than the acrylic stuff, but it lasts longer and feels better. It's thicker and the colors seem richer. Had to pin it! Too adorable for words and wouldn't that make a wonderful shower gift tied onto the package? It's so personal and looks as if it was great fun to create. You're very creative my dear! What a charming idea - wish I had a little one to make it for. Maybe I'll just make one for myself, and sit and look at it and admire it. That's such a sweet idea! I will be coming back to this one soon, I'm sure. I am honoured to have been the namer of Carmen! What a great project! Love it! Your grandgirlies are very blessed to have a creative, doting grandmother. Lovely work, Lorrie. Another beautiful felt project from your hands. This would make a nice baby shower gift! I realize now why yours look so nice--it's the wool felt. So darling and such a great idea! ahh..these are sweet. I love them. I did a Christmas applique advent calendar years ago with felt...mmmm....I might have to try these! Oh.. those are so cute! Not only are they adorable, but a functional toy too! Love them! You're so clever! I love what you've done with the felt, making all of the sweeter than sweet little appliques.